When you write a blog post and you forget to close with a Call To Action you leave readers and site visitors in a passive mode. You increase the likelihood that someone will quickly read through your content and move on. They won’t take action because you didn’t ask them to. Think about it… If you don’t call to your readers to take action on something, they’re less likely to TAKE action. Don’t you think? …so on and so forth. Yes, you can include links to connect with you on your various social networks, but let me ask you this… Do you really want to drive traffic AWAY from your website after working so hard to get them to your website to begin with? (Just a thought). What are your main Calls To Action? Write a list of the things you want to achieve through your website. What (specifically) do you want site visitors to do? Make it obvious. Through badges, wording, etc… Through good design and copy, make it obvious what you want your site visitors to do. Do you want them to subscribe? Do you want them to register to your IDX? Do you want them to contact you? If you want them to contact you, you should probably put your contact phone number and email on the upper right-hand side of your website (don’t make people jump through hoops and pages to find it). Make sure EVERY page and post has a Call To Action. You need to end every post with a Call To Action and make sure that every page has one as well. 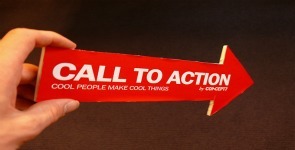 What are the Call To Actions on your website? Are they obvious? What tips do you have for others to encourage site visitors to subscribe and/or register to your IDX, etc.? I am rolling out some calls to action that are a bit more unconventional. Like “How not to get screwed when buying a home”. I am learning that people are highly motivated to not get screwed and will sign up more often to find out what they can do…..and they want to hear it from someone who is being real with them. Does it lead to a client? We’ll see. I guess it all depends on how I nurture it form that point on. @Brad: Now that’s clever. And you’re absolutely right… People don’t like getting “sold” to. They want the information they’re looking for delivered without the fluff. So in this case, well done! Having an accent color for your calls to action can be helpful. Without them it’s possible to overlook what you’re being asked to do. Joseph: Great point. Anything you can do to add a little contrast from the rest of the design and make them pop (stand out), is a great way to draw attention!